These Energized Semiprecious Black Tourmaline is used for protecting one's energy field against negative vibrations, and also for drawing negative energies away from a person. It can have a calming effect when needed, grounding flighty or scattered energies into the earth. Those who suffer from negativity, frequent worrying can work with Black Tourmaline to help heal these issues. Meditation with Black Tourmaline can enhance the integration of insights and visions into one's daily life. Black Tourmaline cleanses, purifies, and transforms dense energy into a lighter vibration. Use Black Tourmaline to help with electromagnetic smog and increase physical vitality. Black Tourmaline is a fantastic stone for grounding and protection from spiritual fear ,phobia and aids in opening up the Root Chakra. Physically, Black Tourmaline is a purifying and detoxifying stone, helpful in cleansing the body. The Chakras are the seven power points in the human body that circulate energy or the life force also known as prana. 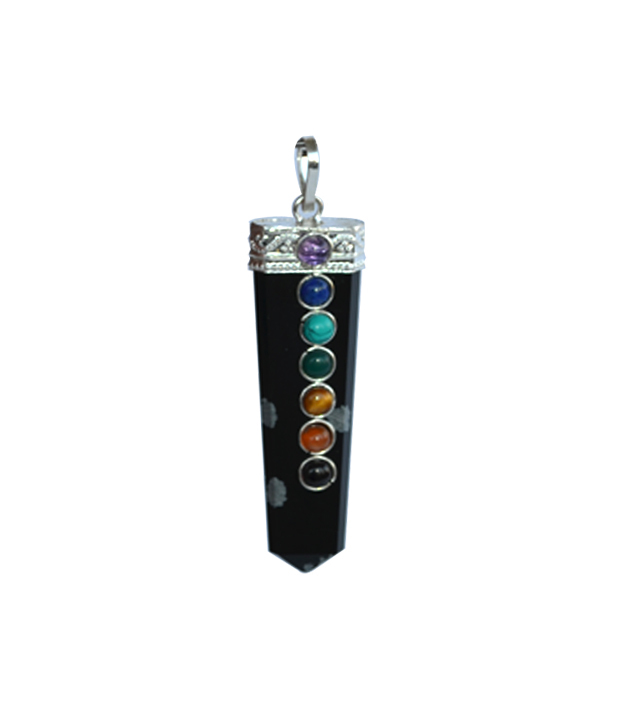 Wear this pendant to clear the energy flow of the chakras. This gorgeous pendant is set with 7 cabochon or faceted chakra semi precious stones on a smart silver colored setting. The stones (from top to bottom) are: • Amethyst - Crown chakra • Iolite - Third Eye chakra • Aquamarine - Throat chakra • Peridot - Heart chakra • Citrine - Solar Plexus chakra • Carnelian - Sacral Hara chakra • Garnet - Root chakra Disclaimer: This Fengshui Product is Believed to bring about all the good things. We do not guarantee its success and are not responsible for any claim. Product colour may slightly vary due to photographic lighting sources or your Screen settings.